A ‘phantom ship’ which had more than a tonne of crystal meth on board has been seized by the Navy during a daring and unexpected operation. The MV Sunrise Glory was intercepted by an Indonesian navy boat patrolling the Phillip Channel between Singapore and Batam. It was flying the flag of Singapore but the crew changed it for the Indonesian one as the military vessel approached. When the boat was taken to Batam for inspection, 1,029 kilograms of crystal methamphetamine were found stashed inside 41 sacks of rice. Four crew members were arrested and the men told their captors that they had planned on taking the drugs to Australia. Officials initially suspected that the Taiwanese fishing boat was a part of a drug syndicate wanted by the Indonesian military. 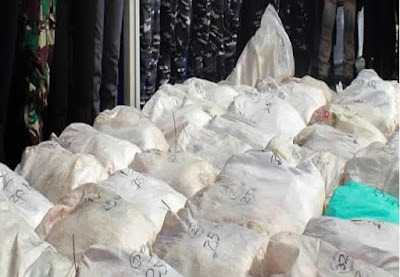 As well as the huge stash of drugs, at least four different national flags and fake documents were found on board, prompting suspicion that the vessel was a ‘phantom ship’ which changes its name and flag depending on which country’s waters it is sailing in to avoid detection.